The temperature is starting to warm up. It will be summer before you know it. And in Japan, summer means kakigori (かき氷) or the country's version of snow cones. One restaurant has that down to an artform. Located in Okinawa, Kome Hachi Soba specializes in soba (buckwheat noodles), but in recent years, the establishment has gotten more notoriety for its creative shaved ice desserts. 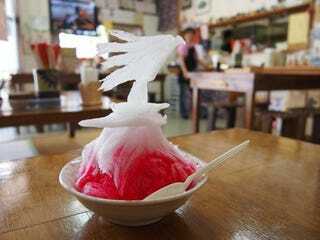 The shaved ice sculptures are severed with colorful syrup or over sweet beans. Delicious and artistic! Some of the sculptures look like horses, eagles, and Japanese storks, while others look like flowers. One sculpture is even supposed to look like the controversial V-22 Osprey military aircraft, which is stationed in Okinawa. Via Another Tokyo, this is supposedly the Osprey aircraft. Hrm, I like the eagles and the horses that look like Pokemon better. These are the work of Kome Hachi Soba's manager, Yoshirou Nagayama. He said he came up with the idea after playing around with the shaved ice machine and started creating interesting shapes.